Though the basic characteristics of translation can be observed in all translation events, different types of translation can be singled out depending on the predominant communicative function of the source text or the form of speech involved in the translation process. Thus we can distinguish between literary and informative translation, on the one hand, and between written and oral translation (or interpretation), on the other hand. Literary translation deals with literary texts, i.e. works of fiction or poetry whose main function is to make an emotional or aesthetic impression upon the reader. Their communicative value depends, first and foremost, on their artistic quality and the translator's primary task is to reproduce this quality in translation. Informative translation is rendering into the target language non-literary texts, the main purpose of which is to convey a certain amount of ideas, to inform the reader. However, if the source text is of some length, its translation can be listed as literary or informative only as an approximation. A literary text may, in fact, include some parts of purely informative character. Contrariwise, informative translation may comprise some elements aimed at achieving an aesthetic effect. Within each group further gradations can be made to bring out more specific problems in literary or informative translation. Literary works are known to fall into a number of genres. Literary translations may be subdivided in the same way, as each genre calls for a specific arrangement and makes use of specific artistic means to impress the reader. Translators of prose, poetry or plays have their own problems. Each of these forms of literary activities comprises a number of subgenres and the translator may specialize in one or some of them in accordance with his talents and experience. The particular tasks inherent in the translation of literary works of each genre are more literary than linguistic. The great challenge to the translator is to combine the maximum equivalence and the high literary merit. The translator of a belles-lettres text is expected to make a careful study of the literary trend the text belongs to, the other works of the same author, the peculiarities of his individual style and manner and so on. This involves both linguistic considerations and skill in literary criticism. A good literary translator must be a versatile scholar and a talented writer or poet. A number of subdivisions can be also suggested for informative translations, though the principles of classification here are somewhat different. Here we may single out translations of scientific and technical texts, of newspaper materials, of official papers and some other types of texts such as public speeches, political and propaganda materials, advertisements, etc. There are also some minor groups of texts that can be considered separately because of the specific problems their translation poses to the translator. They are film scripts, comic strips, commercial advertisements and the like. In dubbing a film the translator is limited in his choice of variants by the necessity to fit the pronunciation of the translated words to the movement of the actor's lips. Translating the captions in a comic strip, the translator will have to consider the numerous allusions to the facts well-known to the regular readers of comics but less familiar to the Russian readers. And in dealing with commercial advertisements he must bear in mind that their sole purpose is to win over the prospective customers. Since the text of translation will deal with quite a different kind of people than the original advertisement was meant for, there is the problem of achieving the same pragmatic effect by introducing the necessary changes in the message. Another obvious classification of translations as written or oral is presented here. As the names suggest, in written translation the source text is in written form, as is the target text. In oral translation or interpretation the interpreter listens to the oral presentation of the original and translates it as an oral message in TL. As a result, in the first case the Receptor of the translation can read it while in the second case he hears it. 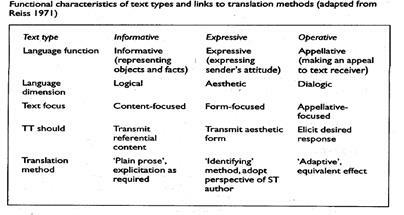 These are all, however, modifications of the two main types of translation. The line of demarcation between written and oral translation is drawn not only because of their forms but also because of the sets of conditions in which the process takes place. The first is continuous, the other momentary. In written translation the original can be read and re-read as many times as the translator may need or like. The same goes for the final product. The translator can re-read his translation, compare it to the original, make the necessary corrections or start his work all over again. He can come back to the preceding part of the original or get the information he needs from the subsequent messages. These are most favorable conditions and here we can expect the best performance and the highest level of equivalence. That is why in theoretical discussions we have usually examples from written translations where the translating process can be observed in all its aspects. The conditions of oral translation impose a number of important restrictions on the translator's performance. Here the interpreter receives a fragment of the original only once and for a short period of time. His translation is also a one-time act with no possibility of any return to the original or any subsequent corrections. This creates additional problems and the users have sometimes; to be content with a lower level of equivalence. There are two main kinds of oral translation — consecutive and simultaneous. In consecutive translation the translating starts after the original speech or some part of it has been completed. Here the interpreter's strategy and the final results depend, to a great extent, on the length of the segment to be translated. If the segment is just a sentence or two the interpreter closely follows the original speech. As often as not, however, the interpreter is expected to translate a long speech which has lasted for scores of minutes or even longer. In this case he has to remember a great number of messages and keep them in mind until he begins his translation. To make this possible the interpreter has to take notes of the original messages, various systems of notation having been suggested for the purpose. The study of, and practice in, such notation is the integral part of the interpreter's training as are special exercises to develop his memory. In simultaneous interpretation the interpreter is supposed to be able to give his translation while the speaker is uttering the original message. This can be achieved with a special radio or telephone-type equipment. The interpreter receives the original speech through his earphones and simultaneously talks into the microphone which transmits his translation to the listeners. This type of translation involves a number of psycholinguistic problems, both of theoretical and practical nature. Interpreter’s note-taking is the process of noting PI- precocious information as the main means for interpreter’s memory. It usually consists of personal names, dates, figures and numbers. Note-taking technique, 1959, principles of François Rosanne. • To write thoughts, not words. • If use words than only shortenings. • To show connection between words. • To cross out means denial and to underline means intensification. • To draw a vertical line after a semantic fragment. There are two major types of film translation: dubbing and subtitling; each of them interferes with the original text to a different extent. On the one hand, dubbing is known to be the method that modifies the source text to a large extent and thus makes it familiar to the target audience through domestication. It is the method in which "the foreign dialogue is adjusted to the mouth and movements of the actor in the film" (Dries 1995: 9 qtd. in Shuttleworth and Cowie 1997: 45) and its aim is seen as making the audience feel as if they were listening to actors actually speaking the target language. On the other hand, subtitling, i.e. supplying a translation of the spoken source language dialogue into the target language in the form of synchronized captions, usually at the bottom of the screen, is the form that alters the source text to the least possible extent and enables the target audience to experience the foreign and be aware of its 'foreignness' at all times. Film can be dubbed, voiced over or subtitled. Subtitles can be used instead of dubbing, as different countries have different traditions regarding the choice between dubbing and subtitling. In most English-speaking countries, dubbing is comparatively rare. Website localization is the process of modifying an existing website to make it accessible, usable and culturally suitable to a target audience. Website localization is a multi-layered process needing both programming expertise and linguistic/cultural knowledge. If either is missing, the chances are that a localization project will encounter problems. A common problem experienced in localization is the effect on layout through translation. Foreign scripts can make your pages need more room or less room depending on the target language in the localization. Not all languages read from left to right. Arabic is from right to left and both Japanese and Chinese are from top to bottom. Culture affects everything we do, say, read, hear and think and even websites cannot escape the influence of culture. The impact of culture on website localization is huge. The above few examples are literally the tip of the iceberg. The number of variables that have to be taken into consideration requires the expertise of both a website designer along with a cross cultural communications consultant. In tandem they can identify the issues that will impact on the successful localization of a site. At a time where the internet is entering more and more houses it is crucial that companies involved in the internationalization of their business consider website localization and take care to use effective cross cultural analysis.